Great news for fans of the lower weight classes. 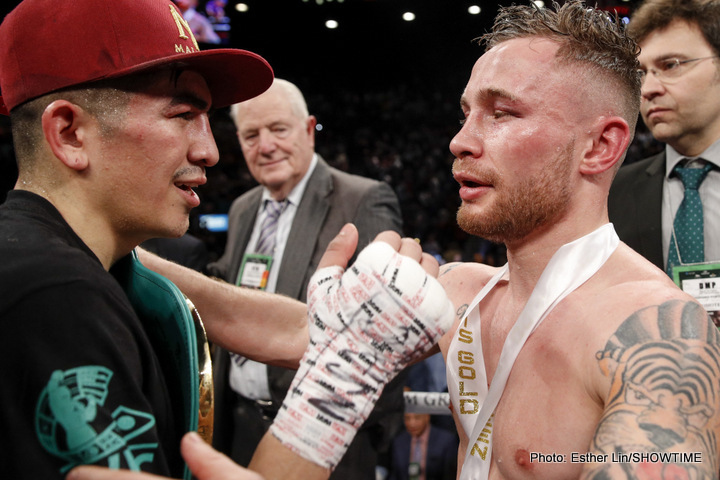 Leo Santa Cruz, one of the most exciting fighters in the world today, and Carl Frampton, ditto – will fight their decider, their rubber-match in 2019. So said Santa Cruz when speaking with FightHype. Santa Cruz said that, “If I win my next fight, I want Frampton next. He wants it, the people want it, I want it.” Hopefully there will be no snags and this great rivalry will indeed be settled some time, some place in 2019. “I’m positive it’s going to happen next year,” Santa Cruz said. Fight fans do indeed want this. In fact it didn’t take very long at all, just after their first great fight had ended, for fight fans to begin talking about the possibility of featherweight warriors Santa Cruz and Frampton engaging in the sport’s next great trilogy. But before this could actually happen Mexico’s Santa Cruz would have to avenge the close points loss he suffered at the hands of Ireland’s Frampton in July of 2016. This Santa Cruz did six months on from the loss, inside a rocking MGM Grand in Las Vegas. Switching tactics, from high-volume punching pressure fighter to smart and patient boxer, Santa Cruz, 35-1-1(19) avenged his sole pro defeat and regained his 126-pound belt. It is perhaps fitting that, like Frampton in fight-one, Santa Cruz emerged victorious with a majority verdict. It was another very close fight, although an extremely classy Frampton refused to make any excuses, saying Santa Cruz fully deserved his win. We’ve come to expect this kind of class from both men; and we can now fully expect the third and final fight between two fighters whose styles compliment each other so well to be another memorable occasion. The rubber-match could prove to be the highlight of 2019. But where might it happen? Before the return fight, Santa Cruz promised he’d come to Belfast to give Frampton a third fight if he won. Frampton, 26-1(15) naturally said great, and now we must wait and see if Santa Cruz is still interested in going to war with “The Jackal” in Northern Ireland. But who wins the third fight and with it the trilogy, wherever it takes place? Can Frampton come up with another game-plan, the way Santa Cruz did, or will the the third fight be a duplicate of the first one: a classic slugfest that either man may edge on the cards? Could we even see a draw in fight-three? Maybe, and perhaps this would be the most fitting result possible. Both fighters are nip-and-tuck, they are both full of respect for one another, and they both enjoy giving the fans great fights. If they did end up all even at 1-1-1, there would probably be no complaints from either fighter; or from their millions of fans. Between them, Santa Cruz and Frampton have come up with some genuinely special fistic chemistry. The final slice of the action could turn out to be the best of the lot.